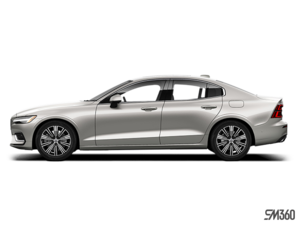 Purchasing a premium car is as much about meeting needs as it is about satisfying one’s personal style and performance criteria, and to these ends the completely redesigned 2019 Volvo S60 fully delivers. With arguably one of the most attractive designs in the compact luxury D-segment, the new S60 could easily be criticized for being all about style, but its duo of formidable powertrains, including a quick- yet smooth-shifting eight-speed automatic transmission and available all-wheel drive, plus myriad additional performance and efficiency technologies, not to mention an award-winning infotainment system, loads of state-of-the-art features, plus the high level of build quality and safety-focused design Volvo has long been admired for delivering throughout its 91-year existence, confirm that the substance of advanced engineering is once again the driving force behind the Swedish brand’s newest offering. Case in point, recent Volvo offerings received IIHS Top Safety Pick and Top Safety Pick Plus ratings, while the S60 includes a full assortment of standard advanced driver assistance and safety features as part of its City Safety package that some others make optional, such as automatic front collision warning with full low- and high-speed autonomous emergency braking, Driver Alert Control, steering support, a Lane Keeping Aid, Run-Off Road Mitigation, and Oncoming Lane Mitigation, as well as all the premium sector’s usual active and passive safety features, plus an additional driver’s knee airbag, front whiplash protection, and pyrotechnical seatbelt pretensioners from front to back. In case you’ve never heard of Oncoming Lane Mitigation, a set of S60 sensors have the ability to detect an imminent head-on collision, which when triggered automatically activates maximum braking pressure a mere two-tenths of a second before impact, thus reducing vehicle speed by up to 10 km/h ahead of impact. This could easily save lives, or at the very least minimize injury. Yes, once again Volvo is ahead of the pack with respect to advanced safety. I could go on and on about safety, especially with respect to the S60’s body structure, which has been designed to thoroughly protect all occupants as part of Volvo’s promise to end all traffic fatalities in its vehicles by 2020 (only a year away), with plenty of effort going into minimizing pedestrian injury via aforementioned electronic aids as well as a frontal design for just that purpose, I can’t help but say something about the shape of this beautiful car, safety aside. It builds on Volvo’s clean, elegant new design language from front to back, integrating a new take on the luxury brand’s hexagonal grille, slimming its trademark “Thor’s Hammer” LED headlights, narrowing, lengthening and lowering its curvaceous profile, the C pillars and rear glass tapering into a subtle integrated deck lid spoiler and wind-cheating Kamm-backed hind end, all of which is bookended by sharper versions of the S90’s stylish C- or hook-shaped LED taillights. It’s a fabulous design that can proudly stand next to the best in this class, while easily overshadowing plenty of also-ran competitors. For those into specifics, the new S60 is 133 millimetres longer than its 2010–2018 second-generation predecessor, now measuring 4,761 mm from bumper to bumper, while its wheelbase spans 96 mm more at 2,872 mm, but thanks to creative interior design that provides substantially more room for driver and passengers, the new sedan has now been narrowed by 15 mm to 1,850 mm in order to fit into tighter parking spaces, while the roofline has been dropped by 53 mm for a sportier look and better aerodynamics. Of course, the longer wheelbase just mentioned provides more rear legroom, something I personally experienced when sliding into the back seat. The new S60’s rear compartment is much more accommodating than its predecessor, with loads of space all around and a nice, wide, cupholder- and what-have-you bin-infused armrest that folds down in the middle. With plenty of space to each side, I was able to almost fully stretch my legs out, while each outboard window seat provided impressive comfort and better than average lower back support. Such praise certainly won’t be unfamiliar territory for current S60 owners when it comes to front seat comfort, as this model has long benefited from some of the industry’s most well-designed, fully enveloping seats, especially appreciated over long trips, or simply when driving back from the office after a hard day’s work. This is when the standard three-way seat warmers come in handy, providing therapeutic levels of relieving heat, while the new S60’s driver’s position is even better than the previous car, thanks to superb telescopic reach from the steering column and excellent adjustability at the seat. The R-Design gets special six-way powered front sport seats that are deeply contoured for excellent lateral support, while full four-way powered lumbar adjustment locates the perfect pressure point to prevent lower back discomfort. What’s more, the bottom cushion of the driver’s seat features a power-extendable squab that ideally cups under the knees for additional support and comfort. Additionally, all S60’s get two-way memory for instantly recalling favourite positions, but take note the R-Design includes special contrast-stitched Fine Nappa leather upholstery that looks sharp thanks to a uniquely sporty design with light contrast stitching, and feels marvelous. While some might notice the seats first and foremost, my eyes were initially pulled toward some of the other S60 R-Design interior features, because the detailing is so over-the-top gorgeous and its overall styling so downright attractive I felt a momentary pause when climbing inside, unusual for we jaded auto journalists. While I’m referring to features found in all S60 trims, such as the jewel-like switchgear used for rotating knobs, the ignition switch, and equally dazzling drive mode selector cylinder that incidentally provides Comfort, Eco and Dynamic sport adjustments, I also loved the R-Design’s stunning Metal Mesh decor inlays, plus its fabulous feeling three-spoke leather-wrapped sport steering wheel, its sporty metal pedals, R-Design-branded floor mats, R-Design-signed metal doorsill treadplates, and cool black headliner. This model also comes standard with a 12.3-inch digital colour TFT gauge cluster that wows at start-up and provides plenty of helpful info while on the go, while the vertical Volvo Sensus centre touchscreen is always a pleasure to use and see, thanks to being designed exactly like a common tablet with the same easy-to-use finger gesture controls including tap, pinch and swipe. It comes standard with Apple CarPlay, Android Auto, and in my tester’s case navigation, while its automatic climate controls pop up on the same display with some of the best looking and easiest to use graphics anywhere. It’s a four-zone system, so rear controls with their own display are included too. Adding perspective to this review, I recently spent three memorable weeks in the new V60 sport wagon, upgraded to Volvo’s top-tier Inscription trim level. When the S60 is suited up similarly its front half is much the same inside, so therefore I can comfortably confirm that Inscription trim is the way to go if you prefer opulent luxury to sporty performance. It’s only slightly more expensive than this R-Design at $53,900 compared to $52,400, and includes a classy chrome waterfall front grille, bright metal window surrounds, special 10-spoke 18-inch alloy wheels, stunning matte Driftwood Décor inlays throughout the cabin, a plush tailored instrument panel featuring soft-touch stitched leather, plus perforated Nappa leather upholstery, ventilated front seats to comfortably cool on hot summer days, and more. Along with all of the high-tech advancements made inside, the new S60 continues forward with two of the auto industry’s most advanced powertrains. The base T5 FWD, found only in Momentum trim, is comprised of a 2.0-litre turbocharged four-cylinder engine driving the front wheels via the aforementioned eight-speed automatic, resulting in competitive performance from its 250 horsepower and 258 lb-ft of torque. Alternatively, Momentum buyers can upgrade to the T6 AWD that comes standard with R-Design and Inscription trims. This configuration adds a supercharger to the turbocharger for a much more spirited 316 horsepower and 295 lb-ft of torque, plus it includes four-season control from grippy all-wheel drive. Both powertrains also feature standard automatic engine start/stop, which lowers emissions and improves fuel efficiency by turning off the engine when it would otherwise be idling, and then automatically restarting it upon takeoff. This helps the base T5 FWD achieve a Transport Canada fuel economy rating of 9.9 L/100km in the city, 6.6 on the highway, and 8.4 combined, while my tester’s T6 AWD powertrain gets a claimed rating of 11.1 L/100km city, 7.3 highway and 9.4 combined. I certainly found it fuel-efficient during my weeklong drive, coming close to meeting its claimed estimates when driving normally and exceeding them when attempting to drive with minimal environmental impact, which is extremely important now that Vancouver’s pump prices are once again reaching stratospheric heights with no immediate relief apparent. As critical as this will be to some owners, I love that Volvo hasn’t forgotten how to make its cars fun to drive. To this end the S60 R-Design is a joy, providing formidable straight-line acceleration thanks to all four of my tester’s optional 235/40R19 Pirelli all-season tires immediately clamping down onto pavement to provide optimal usage of its potent 2.0-litre powerplant. Paddle shifters at the fingers, its multi-speed gearbox flips quickly through its eight forward gears with precise exactness and effortless ease. It’s also ultra-smooth no matter whether its drive selector is set to Comfort, Eco or its sportiest Dynamic mode, although the latter makes for super-quick shift increments and the R-Design’s just noted standard paddles make the most of the hands-on experience. Likewise, when set to Dynamic mode the exhaust gives off a wonderful rasp at full throttle, but otherwise is ideally muffled to conform to the superbly refined interior, the S60 R-Design making for an excellent balance of performance and pleasantries. Notably, the R-Design receives a sport suspension with a reduced ride height and firmer shocks that provide tauter, flatter handling prowess when pressed through fast-paced turns. I gave it my all on a number of occasions, one on a ridiculously curvy stretch of two- and sometimes one-lane pavement heading to North Woodlands, situated a short distance up the coast of Indian Arm from Deep Cove, and just below the elevated road that scales Mount Seymour, and another along Bedwell Bay Road that leads to beautiful Belcarra, and this sportiest of S60s responded in a stable, predictable manner every step of the way, even when hurled into sequential sets of off-camber corners strewn over rough, broken pavement that previously unsettled a few of this car’s rivals, the S60’s more reasonable wheel travel and overall compliance allowing excellent real-world performance without upsetting the confines of its occupants. Such is the result of Volvo’s Scalable Product Architecture (SPA) that underpins most models in the automaker’s current lineup. With the S60 it features aluminum double wishbones up front plus an exclusive integral link setup in back, which boasts a transverse lightweight composite leaf spring. Additionally, I was able to choose the precise steering feel required for the job at hand via driver-selectable low, medium and high personal power steering settings, while I should also mention the S60’s brakes were a good match to this car’s energetic athleticism through some of these particularly hair-raising mountainside backroads. Nevertheless, what I appreciate most about the way the new S60 R-Design drives is how it fully meets the majority of rivals’ when it comes to performance, yet faithfully maintains what should be the prime objective of any luxury car, delivering refined comfort at all times. Furthering this point, the S60 R-Design, which rides on 18-inch alloys in standard trim, owes many of its as yet unmentioned features to the $42,400 base Momentum T5 FWD model noted earlier, including rain-sensing wipers, Road Sign Information (RSI), an auto-dimming rearview mirror, a sizeable powered panoramic sunroof, a Clean Zone Air Quality system and a humidity sensor, rear parking sensors, a reverse camera with active guidelines, voice recognition, twin USB ports, Bluetooth connectivity for phone and audio streaming, Volvo On-Call featuring remote engine start and vehicle tracking, a 170-watt 10-speaker audio system, satellite radio, heatable front seats with driver’s memory, a 120-volt three-prong household-style power outlet on the backside of the front console, power-folding rear seat headrests, plus more on the inside, while the exterior of all S60s benefit from standard dual chrome exhaust pipes. Features specific to the R-Design that have gone unmentioned include a unique front grille, automatic high beams as well as active bending for the previously noted LED headlamps, fog lights also improved by active bending, high-gloss black exterior trim, the same glossy black on the side mirror housings, puddle lamps below the door handles, proximity keyless remote access, and much more. My S60 R-Design tester looked ravishing in its $900 optional Fusion Red Metallic paint, this being one of five extra-cost colours, not to mention no-cost standard Black Stone. All R-Design trimmed cars receive a Charcoal black cabin, but take note if you opt for base Momentum trim Volvo gives you seven exterior colour choices plus a variety of interior hues, while top-line Inscription trim includes eight exterior colours albeit fewer interior combinations, but on the bright side the Momentum model’s upgradable upholsteries are no-cost options with Inscription trim. My tester’s optional 19-inch alloys added $1,000 to the bill, while additional extras included a $1,150 graphical head-up display that projected useful info, such as route guidance directions, onto the windscreen for easy, safe review, plus my car also included a 15-speaker, 1,100-watt Bowers & Wilkins audio system that was not only worth every penny of its $3,750 price tag thanks to superb sound quality, but added a stunning set of aluminum speaker grilles to the doors, plus a really attractive centre dash-mounted tweeter. Volvo also included a $1,250 Climate Package boasting heated Aquablades windshield wipers, a heated steering wheel rim, and heatable rear outboard seats; plus a $1,500 Convenience Package featuring Volvo’s truly outstanding Pilot Assist semi-autonomous drive system, Adaptive Cruise Control, plus a Homelink garage door opener and compass integrated into the rearview mirror; and lastly an $1,800 Vision Package that adds a brilliant 360-degree surround overhead parking monitor, plus an easy to use Park Assist Pilot semi-autonomous self parking system, truly helpful front parking sensors, much appreciated auto-dimming power-retractable side mirrors, and safety-enhancing blindspot monitoring with rear cross traffic alert. On an everyday practical note, Volvo includes two big cupholders under a beautifully detailed scrolling console lid, these even large enough to securely hold my ever-ready water bottle when aggressively taking to the previously mentioned mountainside curves. Storage in mind the S60 also includes a nicely finished, very spacious trunk that can be made even more accommodating via 60/40 split-folding rear seatbacks that house a pass-through at centre for loading skis and other lengthy items. As you can likely tell, the new 2019 S60 R-Design thoroughly impressed me. I think that anyone contemplating a sport-luxury sedan in the compact premium D-segment should take a very close look at Volvo’s latest four-door, as it delivers at an extremely high level when it comes to styling, performance, leading-edge technologies, including safety, and beats many of its rivals when it comes to cabin comfort and overall spaciousness. On a more personal note, I love how wonderfully unique the S60 is when compared to key German and Japanese competitors, with few in this class measuring up to its impressive level of detailed interior finishing, which borders on opulence. It’s truly one of a kind. 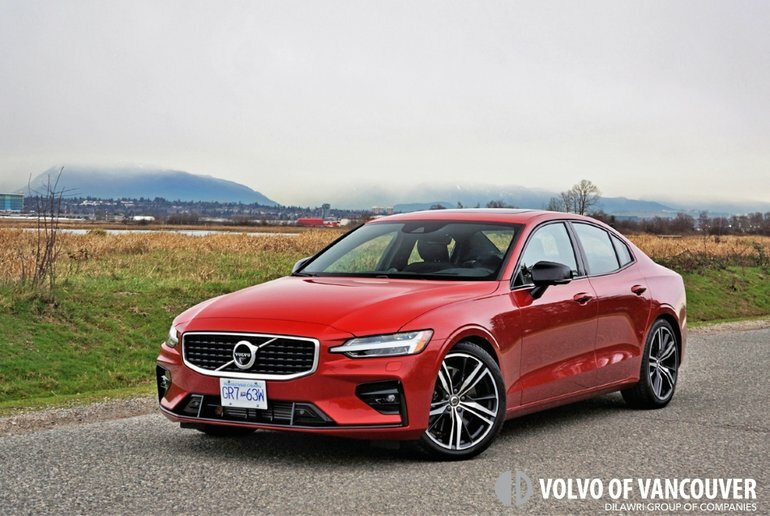 To make sure you get your 2019 S60 in the colour and trim level you prefer, contact Volvo of Vancouver by phone now at (604) 325-1000, or come visit us in our showroom at 8530 Cambie St, Vancouver, just south of Marine Drive behind the new Marine Drive Skytrain Station and Marine Gateway shopping complex.